Forestry, Foresters, Forest Management, Environment, and Environmental Services and Products. 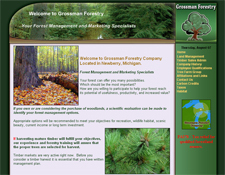 Grossman Forestry Company Located in Newberry, Michigan. Forest Management and Marketing Specialists. Your forest can offer you many possibilities. Which should be the most important? How are you willing to participate to help your forest reach its potential of usefulness, productivity, and increased value?